Home › Living Vegan › Vitamin D! – For You and Me! Vitamin D! – For You and Me! (2) Diet has very little to do with a Vitamin D deficiency. So – as far as Vitamin D goes – there is no real difference between drinking cow’s milk fortified with Vitamin D and soy, almond, cashew, or coconut milk fortified with Vitamin D.
The next biggest sources of Vitamin D in the omnivore diet? Also fortified foods – breakfast cereals and orange juice – the majority of which vegans can eat/drink as well. The naturally occurring sources of Vitamin D in food tend to be in oily, fatty fish – which the majority of Americans probably don’t tend to eat these days. Do American housewives still give their children cod liver oil nightly? Pack their husband sardine sandwiches? Some do eat salmon once or twice a week – and that’s about where natural consumption of Vitamin D in foods begins and ends. So, if people aren’t getting Vitamin D from foods – where are they getting it from? And that explains why Vitamin D is an equal opportunity vitamin (at least between vegans and omnivores). Synthesis of vitamin D (specifically cholecalciferol) in the skin is the major natural source of the vitamin. Dermal synthesis of vitamin D from cholesterol is dependent on sun exposure. So how might you become deficient in Vitamin D (regardless of diet)? You have fair skin and usually wear suncreen. You have darker skin, with more melanin (which acts as a naturally occurring suncreen). You work in an office most of the day (think Tom Hanks in Joe Versus the Volcano). You live in a climate which is cloudy and doesn’t see much sun, or has long winters. You are over 50, and thus may be slower at metabolizing sunlight into Vitamin D.
You are overweight – Vitamin D release is extracted by fat cells, and a greater percentage of fat cells may alter the release of Vitamin D into your body. You have a digestive disorder, such as Crohn’s or Celiac’s disease, which may limit your ability to extract Vitamin D from any fortified foods you eat. Vitamin D is directly related to bone health – including rickets and osteoporosis. There’s also some evidence increasing Vitamin D levels can result in less pain from arthritis and fibromyalgia. When Vitamin D first started making headlines about 10 years ago, I started my mother on a supplement plan and she experienced greatly decreased pain from her osteoarthritis and fibromyalgia. Vitamin D deficiency has been linked to depression, dementia, and other mental disorders. There’s also some very interesting research that women with fibroids have very low levels of Vitamin D. A large proportion of fibroid sufferers (especially early fibroid sufferers – in their 20’s) are African-American, so it’s possible their melanin may interfere with production of Vitamin D.
If you feel you have physical symptoms or medical problems that suggest you may have low vitamin D (bone aches, pains, brain fog, depression, a family history of digestive disorders or fibroids) strongly consider asking your doctor check your blood for Vitamin D levels at your next blood workup. If you have any current medical problems such as arthritis, osteoporosis, history of radiation, digestive disorders, or fibroids – DEFINITELY schedule a bloodtest with your doctor. If it turns out you are deficient (and so many of both my OMNIVORE and VEGAN friends are) he/she will probably write you an Rx for a few weeks. 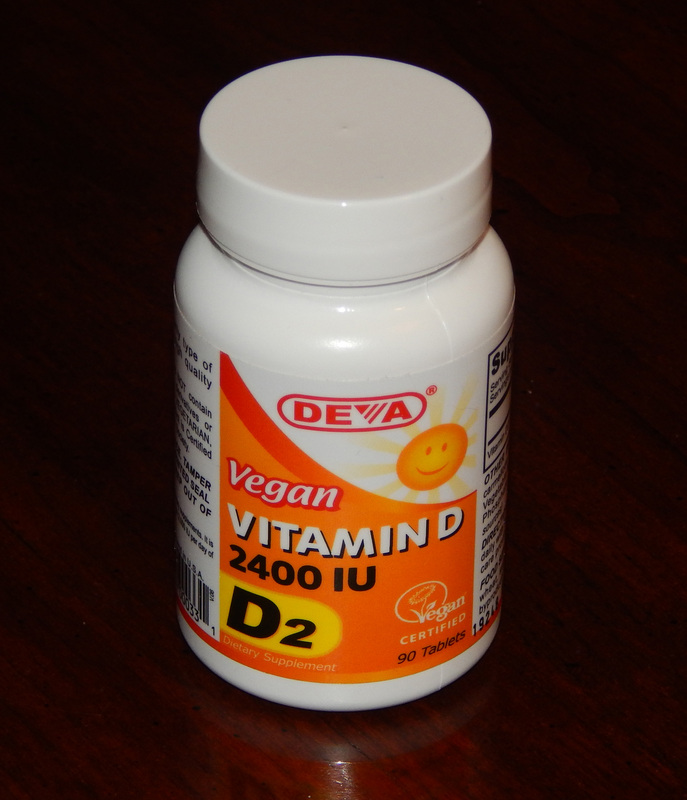 Vitamin D3 is animal derived. Vitamin D2 is vegan. Some scary sites out there say that the human body cannot absorb Vitamin D2 as well as D3, but I’ve noticed the majority (if not all) of the Rxs for Vitamin D for my friends have been for D2. Worried about OD’ing? Don’t … it’s extremely hard, unless you really, really, really like cod liver oil. Current guidelines say harmful levels only occur after 4,000 IUs/day; the Vitamin D council suggests up to 10,000 IUs/day is safe! Spend a little more time walking in (or on) sunshine.